fixes to problems with MacBook Pro 2018 models using external displays when some USB graphics devices are also connected. Security fixes are also relatively few in number, just ten, but of those half are in the kernel, according to Apple’s detailed listing. There are EFI firmware updates for MacBookPro13,1, 13,2 and 13,3, and for at least some models with T2 chips (iMac Pro for certain). The standard installer contains a full set of current firmware updaters. I have already updated my list of current firmware versions. Voice Memos, at version 2.0. A great deal of the command tools and other files in /usr are also replaced, as is a lot of Marzipan iOSSupport. Most of the apps, tools and components in /System/Library/CoreServices are replaced, as are most extensions, most public and private frameworks, and a lot of Perl 5.18 and Tcl 8.5. Again, Apple does not tell us whether any of these changes result in fixing of existing bugs or new features. Oddly, the latest version 16.0 of TCC’s AllowApplicationsList.plist is replaced by an older version 15.0 in this update. 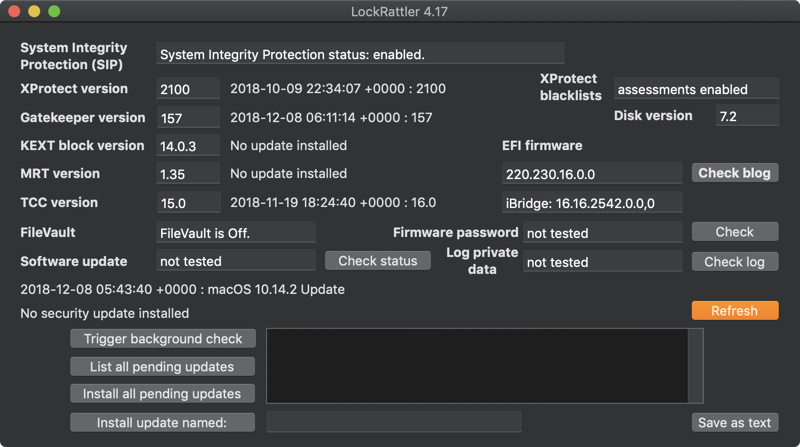 This is the first time that I can recall a macOS update reverting to an older version of a security data file like this, and I suspect that this may have been an error. Don’t be surprised if in a few days version 16.0 is pushed out again. APFS has been updated from version 945.220.38 in 10.14.1 to 945.230.6 in 10.14.2. Posted in Macs, Technology and tagged APFS, App Store, Apple, iTunes, macOS 10.14, Mail, Mojave, news, Safari, security, TextEdit, update. Bookmark the permalink. Can anyone tell any change in Books? Thank you, Phil: that confirms that the iMac Pro and MBP 2018 are running the same firmware. I suspect that the new MBA and mini do so too – perhaps someone with one would be good enough to report, please? I have updated the EFI firmware listing here, adding more detail on the MBP13 series which has become a bit more complex now. “APFS has been updated from version 945.220.38 in 10.14.1 to 945.230.6 in 10.14.2”. Which means that APFS is work in progress. I wish Apple had released it when finished instead. Everything in every OS is a work in progress: the kernel keeps changing, and even HFS+ isn’t static. The only way to support that progress is for users to use the file system, and for bugs to shake out, and improved features to be tested. You can’t just develop a file system to completion and perfection before putting it into general use. However, the relatively small increments to the APFS version numbers now indicate maturity, which is welcome. What is most frustrating is that Apple never tells us what has changed – not even a list of significant issues fixed or changed for developers. We just have to discover that for ourselves. Can AppleRAID on APFS now boot a Mac? Who knows? Probably because not even Apple know what the final specifications will be. Also needed is Time Machine 2 with full support for APFS, besides DiskWarrior for APFS. Hopefully by next year. I guess in macOS 10.15 (probably named Sequoia, Sonoma or Ventura). BTW, the mouse I-Beam Pointer is hard to spot on this black background form, which makes it harder to select something, or place the cursor where desired. I am using Safari 12.0.2 (12606.3.4.1.4) on macOS 10.12.6 (16G1710) on iMac 5K Retina (mid 2017). It would be useful to turn off such “Dark Mode”, at least as an option. That is just a suggestion for your consideration. And congratulations for this insanely great site, which is really awesome! ‘If playback doesn’t start shortly, try re-starting your device’. If you have any ideas about this, I’d really appreciate hearing them. Best wishes! I presume that you have checked your Network settings and internet download speed, which shouldn’t have changed. I’d also check general factors which could be causing such problems: EtreCheck should be a good way of identifying those. You should also check your Internet Plug-ins for anything old or suspect. Beyond those, the checks required need to be fairly interactive. Have you tried Apple support? With such a recent iMac and a new macOS, I’m sure they’d be very keen to help you get to the bottom of your problems. If you have an iPhone or other iOS device, the free Apple Support app is a very good way to do this.